This is a photograph that I took a few days ago during a walk on the beach at low tide. This was an unexpected adventure; the original plan was to walk on Lothrop Street here in Beverly, MA, and to see the lovely homes on this residential street near the ocean. So I was dressed for a walk on sidewalk, not for exploring a rocky beach at low tide. I was wearing my Croc sandals, which are only slightly more substantial than flipflops. These are great for sand, but not so good on stones. So I really had to watch where I was stepping to keep my balance in my very silly shoes. But looking down has its benefits. Because I was looking down, I was paying attention to what I was seeing on the ground. I noticed that the stones were quite beautiful and took some photos. 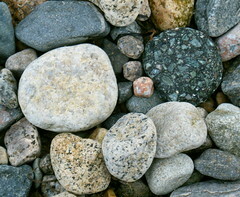 Tonight I cropped this image out of one of the photos of stones, trying for a close-in view and a pleasing composition. I call it a "beachscape"; as the walk continued, the view looking down shifted, so I kept taking pictures. To be continued. . .
Beautiful. Could this be the beginning of a new painting series?